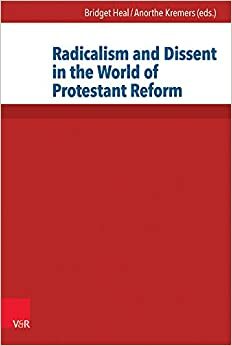 This volume of essays explores the themes of radicalism and dissent within Protestantism. The comparisons highlight the contingent nature of particular settlements and narratives, and reveal the extent to which the definition of religious radicalism was dependent upon immediate context and show that radicalism and dissent were truly transnational phenomena. The historiography of the so-called radical reformation has been unduly shaped by the hostile categories imposed by mainstream or magisterial reformers during the sixteenth and seventeenth centuries. This volume argues that scholars should adopt an open-ended understanding of evangelical reform, and recognize that the boundaries between radicalism and its opposite were not always firmly drawn. The distinction between the two is an inheritance of the Lutheran Reformation of the 1520s, which shaped not only the later course of the Reformation in the Holy Roman Empire but also attitudes towards and writings on religious dissent in the Netherlands and England. Radical critique is immanent within mainstream Protestantism, in a faith that emphasizes the power of the gospel with its unrelenting demands.